Visit New Haven’s Dining Guide | PromiseNet’s Special Offers! Even the most nay-saying nay-sayers would have a hard time criticizing the restaurant scene in New Haven. There is something for all. The following is simply a range of downtown spots. If you want in-depth gastro-analysis, Mara Lavitt of the New Haven Register is on the case. Let’s start with one place a little off the beaten path. It is Frank Pepe’s Pizzeria (157 Wooster Street), which has been honored as having the best pizza in America. Take that New York and Chicago. The actual winner was the Pepe’s White Clam Pizza. Consiglio’s (165 Wooster Street) is next to Pepe’s and is offering a special 15 percent discount to PromiseNet parties spending at least $50. If you aren’t up for that short trip from downtown, you can get pizza at Bar Night Club (254 Crown Street), which is where the young folks go. Right across the street from Bar is the historic Louis’ Lunch (261 Crown Street), which claims to be the birthplace of the hamburger. Is it a restaurant or a bookstore? Atticus Bookstore Cafe (1082 Chapel Street) is both — and not like some chain bookstore with pre-packaged turkey sandwiches and juice boxes. If you want to watch Bronx Tale, Goodfellas or Scarface while you eat Italian food, Good Fellas (702 State Street) is the place for you. Seriously, no sports, just Italian flicks. Some great dining and social options include Barcelona New Haven (155 Temple Street), the Union League Cafe (1032 Chapel Street) and Heirloom at The Study (1157 Chapel Street), but also consider the amazing Soul de Cuba Cafe (283 Crown Street), which doesn’t fit more than 25 people. Call ahead for that one. Added incentive: free Mojito with dinner for PromiseNet attendees! If you have a hankering for bar food and beer, try Kelly’s gastro Pub (196 Crown Street), O’Toole’s Irish Pub (157 Orange Street) or J.P. Dempsey’s Bar & Restaurant (974 State Street), which is a friendly biker bar. Yes, we have a Chipolte, but we aren’t telling you where it is. 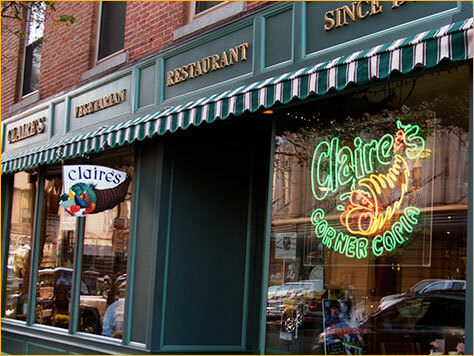 Right across from the New Haven Green is Claire’s Corner Copia (1000 Chapel Street), a great vegetarian spot that has been feeding the health of New Haven for four decades. Yale’s campus houses the famed Blue State Coffee (84 Wall Street & 276 York Street) as well as Mory’s (306 York Street), which has been serving Yalies since 1849. They’ve relaxed the rules there, but they’d still rather see you in coat-and-tie while keeping your smart phone in your pocket.